Modify and add data collection forms without needing to plan database changes. Save time and reduce errors with EventHalo's flexible application forms, custom review processes, and online payment processing. Reduce cost and improve attendee experience, from simple crew lists, to hundreds of managed lists, MealWheel® makes it all easy. EventHalo is a platform to integrate your event, from planning, to show days, and post-event analytics. Less data entry, faster delivery, and fewer errors - connecting up your workflow really helps. 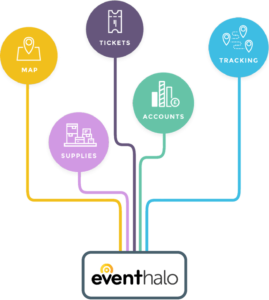 From applications to purchase orders, and inventory to invoicing, EventHalo can help you keep control. Find out how we can transform your event. Arrange an on-screen demonstration, we can show you how we assist every stage of your event, and set up your next event.